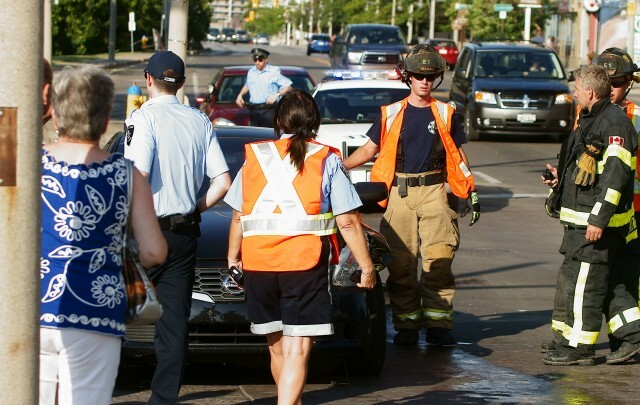 Around thirty people gathered to watch after witnessing two cars slam into each other at the foot of Ouellette Avenue around dinner hour Saturday. No one was seriously injured when a black Nissan Altima and an older model red car collided in the intersection of Riverside Drive and Ouellette Avenue. The Altima suffered extensive body damage along its left side, a crumpled front end and the vehicle’s air bags deployed. The red car lost its bumper and suffered significant front end damage. 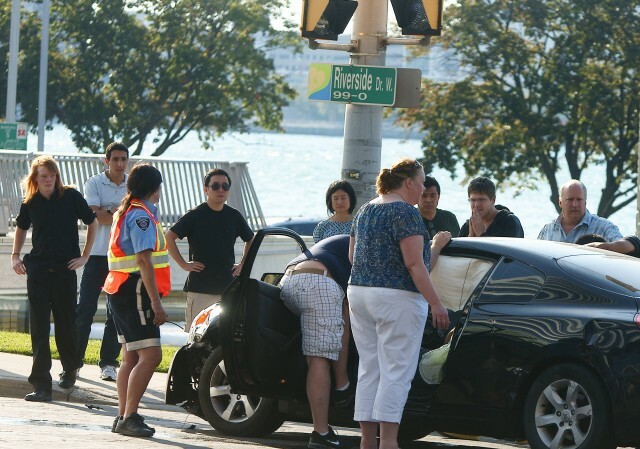 Pedestrians and two Windsor Parking Enforcement officers attended to the injured drivers before firefighters and ambulances arrived. Both drivers were treated by EMS for minor injuries. Firefighters cleaned up a fluid leak on the street.